Would you like to find the best way to build your child’s self esteem and get better behavior at the same time? Try to use positive reinforcement to build on good behavior and watch your child grow more confident and repeat the good behavior. Children love praise for things they do that please you. What better way to improve behavior than to focus on the positive in your child and let him or her know that you are aware of the good behavior. By using positive reinforcement you create building blocks for your child’s good behavior and self confidence. Try it and see how you and your child benefit! We as parents are faced with some difficult choices when it comes to disciplining our children. There are those who follow an “old school” train of though that discipline should involve instilling fear in children by trying to correct bad behavior by physical punishment by way of spanking or worse. In some cases, that method creates a disciplined child, but a child whose discipline is based on fear of their parents. There are others who would tend to continually ask their children to behave, but who use no tools to help them actually get good behavior. This is more of a “discipline without discipline” method and often results in the child really running the show, and doing what he or she wants to do, when they want to do it. The end result of that method is usually frustration on the part of the parents, and lack of discipline for the child. Another method, which has been incorporated in to the Ticket Store Game, uses the concepts of children “earning” their way to good behavior and then using the powerful method of positive reinforcement to reinforce the good behavior. Set behavior goals for your child to achieve, reward the child for achieving the goal, and then reinforce the behavior. While each of us have to determine which method is best for our children and families, there are some real benefits to creating lasting behavioral traits from positive reinforcement. Whether you use the patented Ticket Store Game method or just the concepts that have been incorporated in the game, you may want to consider which type of discipline is right for you, and start to implement a consistent plan to achieve your goals! We like to get better behavior-one ticket at a time! Here is a helpful article from ADD Magazine for getting better behavior from your kids which incorporates many of the methods used with the Ticket Store Game. Schedule 15 minutes each day with your child, to do whatever he wants to. Playing together helps repair the parent-child bond and lays the groundwork for positive reinforcement n the future. Positive reinforcement is the best behavioral tool, and especially powerful when it comes from a parent. Look for opportunities throughout the day to praise your child. Keep praise immediate and enthusiastic, and specify the exact behavior you’re commending. This works especially well with young children. Tokens can be anything tangible and easily recorded — stars on a chart, coins in a jar — and should be awarded promptly for good behavior. Once a certain number of tokens are amassed, the child earns a predetermined reward, such as a video game, a sleepover at a friend’s house, or a trip to the movies. These consequences should involve taking away privileges, such as access to the TV, playtime with friends, or another favorite activity. Particularly bad conduct, such as hitting or other physical violence should result in an extended time-out (30 minutes for children over 8, an hour for adolescents), in an isolated room, where the child is instructed to think about his or her behavior. Stick to the consequences, no matter what. Experiencing a child melt down in a public place or even in your home can be a very frustrating experience. Your self control can actually lead to your child’s self control. If you do not act out of impulse to your child’s melt down, but try a more reasoned approach, you will have a much better chance of getting the melt down under control. The process can be difficult, but can bring back real rewards for the parents in the form of good behavior. For example, if you tell your child you are not serving dessert until after dinner, and the child cries and whines and has a tantrum, if you exercise self control by not giving in, your child will learn that the temper tantrum will not give him the result he wants, and he may actually lose dessert altogether. The learned behavior will be that it is better to wait for dessert than to melt down. up to 2 year olds: Try to distract them with their favorite toy or activity. As the child gets closer to 2, try a brief time out so that the child will understand the consequences of his actions. Also, praise your child for calming himself. Positive reinforcement can go a long way in getting a message across. 3 to 5 year olds: Continue with the time out, but consider having the time out last until the child has completely calmed down, with no time limit. This will help your child to develop self control, since he will realize that the time out will not stop until he has regained his self control. Again, reinforce the child’s progress and ability to regain control by praise and positive reinforcement. 6 to 9 year olds: As children spend more time in school, they tend to start to understand more about the consequences of their actions. Encourage children in this age group to stop and think about what will happen based on their actions. Help your child to understand that he can walk away from situations that may cause a melt down reaction. And encourage and praise good behavior. 10 to 11 year olds: As children reach this age, they are generally becoming more aware of their feelings and have the ability to think through situations that may cause them to lose control. Help your child to take time to think through a situation before responding to it. They may find that the situation is not as bad as they had initially thought, and as a result, the melt down is avoided. Teaching a child self control is important since that skill will likely stay with the child for their whole life. 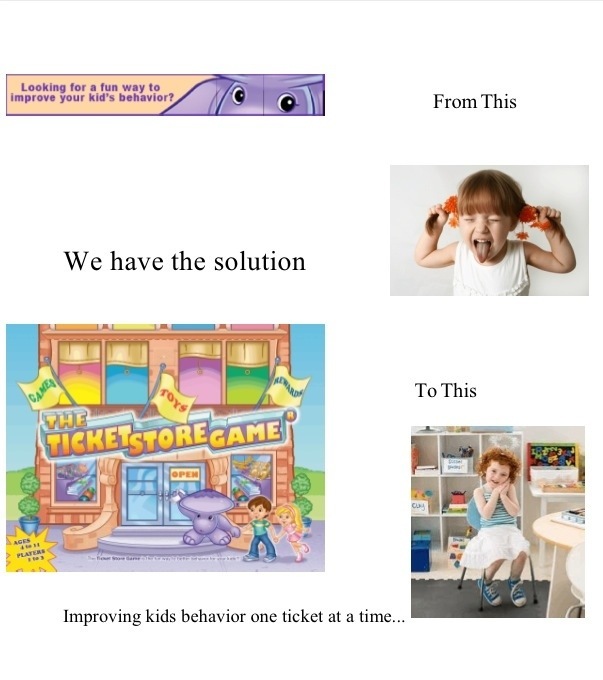 Of course, each situation is different for every child, but using these suggestions along with incorporating the day to day concepts of the Ticket Store Game can help your child improve his behavior, and hopefully avoid the melt down!